Dry Lake’s high summer collection - with inspiration taken straight from the Riviera resort’s relaxed fabulous summer vibe fashion. The Gold Dot on off white Chiffon material is perfect for hot summer days best spent in the shadow of a palm tree. Nanny Dress is a beautiful and thought-through summer piece in light chiffon that allows your skin to breath and a viscose body lining. 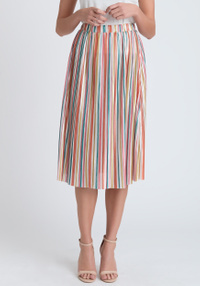 What’s unique for Nanny Dress (that occurs in different colours and materials) is the gatherings in the skirt and flowy unlined flares that wraps along all the way to its’ ending. The wrap style is both practical and beautiful and is a very popular type of dress in the Scandinavian countries. The wrap is supported by a waist tie band tied best in the side front and forms a v-neckline. The semi-length loose sleeves are left unlined and slightly see-through. Gold stripes, consisted of small stamped gold dots on the white chiffon makes all the pieces in this material elegant, feminine and delicate. Can handle careful machine wash. See also Summer Blouse, Elle Skirt and Valentina Long Dress in same Gold Dot Chiffon.